All Entries Tagged With: "Patient Safety"
A review of more than 2,000 neurosurgical cases published in the Journal of the American Medical Association, found no greater risk of postoperative complications for patients operated on by surgeons conducting overlapping surgeries. This casts a new light on the controversial practice, which is routine at many facilities nationwide. The study, published earlier this month, examined patients who underwent neurosurgical procedures at Emory University Hospital in Atlanta from 2014 to 2015. Of the 2,275 cases reviewed, about 43% had the surgeon remain with the patient through the entire procedure. In the other 57% of cases, the primary surgeon performed two procedures in different operating rooms. In the 90 days following their operations, no difference was found in morbidity, mortality, or worsened outcome measures between the two groups of patients. The researchers concluded that this data suggests overlapping neurosurgeries are safe and may benefit patients by allowing sought-after specialists to see more patients. That said, researchers did note that overlapping surgeries were notably longer than when one surgery was done at a time. And guidelines from the American College of Surgeons require that patients be informed that they’ll be undergoing a concurrent surgery. “Surgeons must use their experience, keen intuition and respect for their own ability and limitations to carefully select patients” for overlapping surgery, the authors wrote. The Illinois Pain Institute (IPI) was having trouble with its electronic health records (EHR). So they got rid of them and went back to paper. And they aren’t planning on going back anytime soon. Two years ago, all 70 members of the IPI voted unanimously to get rid of its EHR saying it was slowing down care and alienating patients. “We felt the level of patient care was not enhanced by an electronic health record. We saw it was inefficient and added nonproductive work to physicians’ time,” John Prunskis, MD, IPI founder and co-medical director told Becker’s Hospital Review. Since the switch, IPI has reported greater ease communicating information between hospital systems, less time spent on data entry, happier patients and staff. The IPI’s feelings are echoed by many physicians, according to the Mayo Clinic, which in 2016 found in EHR usage reduces physician satisfaction and increases burnout. Another study from the same year found that for every hour physicians spend with patients, they spend two hours interfacing with their EHR. When is it okay to text and operate? Several perioperative professional associations have weighed in on the use of personal mobile devices, including the Association of periOperative Registered Nurses, the American Association of Orthopaedic Surgeons, and the American Association of Nurse Anesthetists. See the appendix for the American College of Surgeons’ statement on the use of cell phones in the operating room and links to policies of other organizations. Healthcare leaders who decide to limit use of personal mobile devices during work hours must balance multiple considerations: patient safety, the impact on workflows in the organization, and the potential effect on employees and affiliated providers. 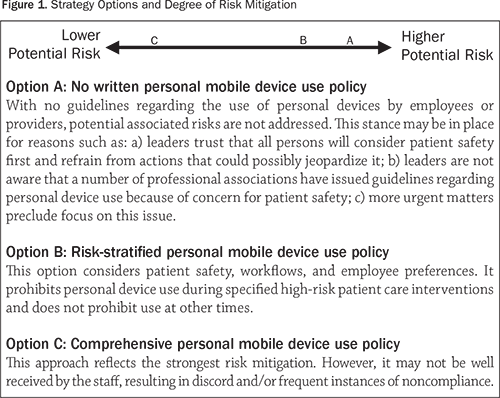 Policies to control the use of personal devices can be perceived as positioned at various points on the risk mitigation continuum (Figure 1).